The purpose of the Association is to provide a permanent organization to preserve and further the development of the common bond existing between all persons who have honorably served or are serving with the Joint Communications Unit ("JCU") of the United States Armed Forces, to encourage patriotism, to honor the memory of deceased JCU members and other veterans, and to provide aid and assistance to those members, veterans, and their dependents, in need. Welcome to our new site. Take the time to browse our pages and see what's new. Registration is open for the 21st Annual JSO 10K. We will host the event on Saturday November 11, 2017 at Fort Bragg, NC. This is sure to be another great event and we hope that you will join us. For more information, please visit our JSO 10K page. SOCA dedicated the JCU Memorial, officially turning it over to the Joint Communications Unit on April 7, 2017. It is a beautiful gift that we were very proud to offer to this presigious unit. See what's new or what's up and coming with SOCA. Annual 2017 Scholarship and Young Patriot Essay contest winners. Congratulations to this years winners of our annual essay contests. for the complete list, please visit the pages under the initiatives tab. Was formed in 2006. Since then, we have transformed SOCA into what it is today. 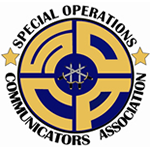 SOCA is now Incorporated in North Carolina and is the official 501c(19) Veterans Organization of the Joint Communications Unit (JCU). Over the years, we have done what we believe are some pretty important initiatives. We were proud to help gain support and raise funds to donate to the Support Warren Campaign that helped a very sick little boy get a much needed operation procedure. Warren is the son of a JCU Veteran. In April 2011, a series of storms and tornadoes swept across North Carolina. SOCA put together a special disaster relief donation campaign for our local victims. We supported the family of a Navy Seal Communicator who was KIA in Afghanistan through special donations collected by SOCA and in-turn donated 100% of these funds to the Jared Day Memorial Fund. In September of 2011, JCU member GySgt Christopher E. Cunningham was involved in a tragic traffic accident that eventually took his life. Through the very generous donations to us for his family, we were able to raise money that paid for various funeral and memorial ceremony expenses. Through our organization, we provide many benefits for our veteran members of the Joint Communications Unit, Alumni and family members. Some of these benefits include; Annual scholarship awards program, quarterly Service Member and Civilian Member of the Quarter awards, annual Service Member and Civilian Member of the Year awards, Annual JCU Anniversary Ball, annual JCU Children's Christmas party and providing numerous care packages for our deployed members..
SOCA relies almost 100% on sponsor donations from our two annual fundraisers. It is because of these sponsorships that these two events can be organized and provide such a good time for all. All proceeds remaining will in-turn support all the benefits listed above. Joint Special Operations 10K- The JSO 10K has for many years, been run on Fort Bragg. From its very humble beginnings, it has continued to grow and attract more participants each year. The setting for the 10K is the area behind McKellar's Lodge (Training Area K). It is completely off road, the course is sandy, muddy, hilly and very challenging. We offer a 5K fun walk as well on the same course for families and children to come out and enjoy the day with us. Soon after the completion of the race, we have an awards ceremony and provide refreshments. For complete details, please visit our JSO 10K page. SOCA Golf Tournament at Carolina Lakes Golf Club in Sanford, NC. The tournament is not widely publicized because of the limits on golf teams. The tournament is mostly full of sponsor teams and is our way of showing how important they are to our organization. Through our sponsor donations, we invite four soldiers every year from the Warrior Transition Battalion on Fort Bragg to join us as guests for the day. Their day is free and they are placed as individuals on four sponsor teams. For complete details, please visit our Golf Tournament page. Freedom 5K & Kids Fun Run; Cape Coral, Florida. The Priority Business Solutions Freedom 5k and Gunterberg Charitable Foundation - Culliton Family Kids Fun Run, presented by the Chamber of Commerce of Cape Coral is held on the 4th of July every year at the base of the Cape Coral Bridge on Cape Coral Parkway. A portion of the proceeds from the 5k go to Invest In America's Veterans Foundation - IAVF and the Special Operations Communicators Association (SOCA). This 5k is challenging and fun for the whole family. For more information, call (239) 549-6900 ext 111. A portion of the proceeds for this race are donated to SOCA in partnership with the Chamber of Commerce Cape Coral and all its surrounding communities. We thank you.